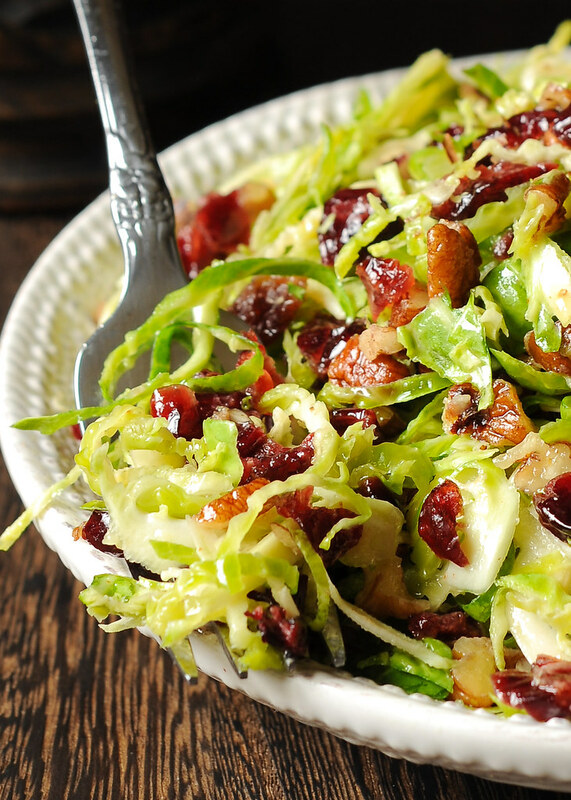 Honey Mustard Brussels Sprout Salad with Cranberries and Pecans - What's In The Pan? Shredded Brussels sprouts are a worthy rival to lettuce leaves in this delicious salad that’s studded with pecans and dried cranberries. I’ve shared several recipes that call for this versatile and healthy vegetable, such as Creamy Garlic Brussels, Brussels Sprout Coleslaw, Brussels sprouts Gratin and Warm Quinoa Salad with Brussels Sprouts, So if you’re a lover of Brussels like I am, be sure to check out those delicious recipes too. In this shredded Brussels sprout salad recipe, we’re keeping them in their raw state and shredding them to use as a hearty stand in for lettuce. 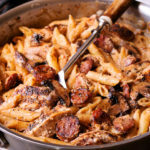 This recipe makes a large enough batch for 4 to 5 people to share. This Brussels sprout salad will keep well in an air-tight container in the fridge for up to 4-5 days. 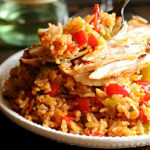 Add some chopped protein (such as chicken, turkey or pork) and you’ll have yourself a delicious and well-balanced lunch. Brussels Sprouts Salad with Honey Dijon Vinaigrette – a crowd-pleasing addition to your holiday table. You can either shred the Brussels sprouts yourself or use pre-shredded sprouts – either way it’s healthy, it’s full of flavor, and can be prepped a day or even two days before it’s on the menu. Don’t you love prep ahead Brussels sprouts recipes! If using whole Brussels I recommend using a food processor with the shredding blade. I used red wine vinegar in combination with Dijon mustard and honey and it is absolutely ideal dressing for Brussels sprout salad! Honey in the dressing brings pleasant sweetness to the sprouts and also complements pecans very well. And mustard makes the dressing very creamy, just like mayonnaise, but without the calories. I did a little research how to prepare a basic honey mustard vinaigrette for this amazing Honey Mustard Brussels Sprout Salad. Almost all the recipes I found call for a 3 to 1 ratio of oil to vinegar. Here I use 1/3 cup olive oil and 2 tbsp red wine vinegar. 1/3 cup equals 5 tablespoons and 1 teaspoon, so it’s slightly more on the vinegar side. If you prefer to go with less vinegar, start with 1 tablespoon, taste it and proceed to add more. Or add more oil. Mustard here serves as an emulsifier to our honey mustard dressing. Not only does it add an additional layer of flavor, it also keeps the oil and vinegar from separating. That’s what an emulsifier does. And remember, first you combine the vinegar and mustard, season with salt and pepper and then slowly drizzle in the oil while whisking the ingredients together. Trim the end off of each Brussels sprout by cutting the dark thin slice off of the root end. In a food processor fitted with the slicing attachment as shown in my picture below, shred the Brussels sprouts. But if you don’t have a food processor, you can just thinly slice the Brussels sprouts with a knife. This is the attachment I used to shred my Brussels Sprouts. This Honey Mustard Brussels sprout salad is perfect for potlucks or holiday meals, but you may find it to be a perfect complement to your everyday dinner as well. And it’s gluten-free! 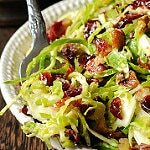 This delicious Honey Mustard Brussels Sprout Salad with Cranberries and Pecans is all about crisp, shredded Brussels sprouts tossed with slightly sweet honey mustard vinaigrette, dried cranberries and chopped pecans. Has anyone tried this with candied pecans? How was it? Lovely salad! Love your recipes. This was sooo delicious. My kids love it and it’s not easy to get my youngest to eat his veggies. That’s such a great complement! It is not easy to get kids eat their veggies. 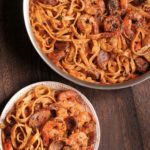 Hi…I haven’t had my instant pot very long and even though I cook a lot, I am still a little timid when I use it. After reading some of your recipes I have to say I love the way you describe things. 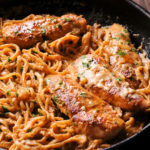 You answer a lot of those little questions that I have when I use my instant pot, the things other recipes don’t tell you. You explain things so well that I know when I use my IP again, I’ll do it with more confidence! Thanks so much, and btw your recipes look yummy. I can’t wait to try them. My mouth was watering just reading them! Thanks Peg – I loved reading this comment. You are very kind.